Southwest of the Acropolis, starting from the foot of Filopappou Hill and stretching west to Pireos Street, Petralona is a large residential neighborhood that is split down the middle by rail tracks, forming the picturesque Ano Petralona, which is closer to the Acropolis, and Kato Petralona (Upper Petralona and Lower Petralona, respectively). Settled since ancient times, the area has had a long and winding history: it was abandoned and later re-inhabited, and renamed several times (at one point, Kato Petralona was known as Katsikadika – from the word “katsika,” which means goat – due to the large number of goat herders in the area). Later, a part of Ano Petralona came to be known as Assyrmatos or Attaliotika after 1922, when around 800 families of Greek refugees from Asia Minor settled here. 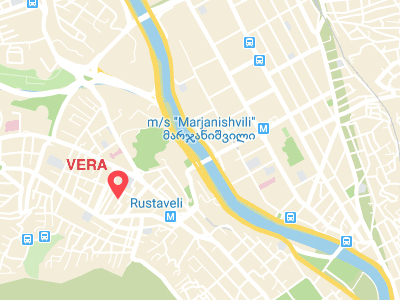 Over time, some of their impoverished homes were replaced by a large, drab apartment block built for workers and, alternatively, at the behest of Queen Frederiki in the 1950s, beautiful stone houses. Some of the ramshackle sheds remained and were later romanticized by the film Dream District (1961), which was shot here. 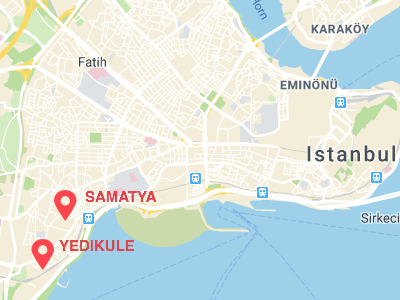 Since then, this formerly working-class area has steadily morphed into a bohemian enclave beloved by Athenians, which is what makes it so appealing. 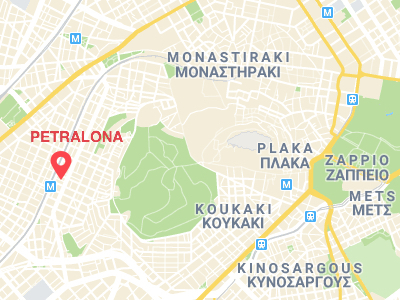 This is partly because Petralona, despite its proximity to the Acropolis, never became overrun with tourists. 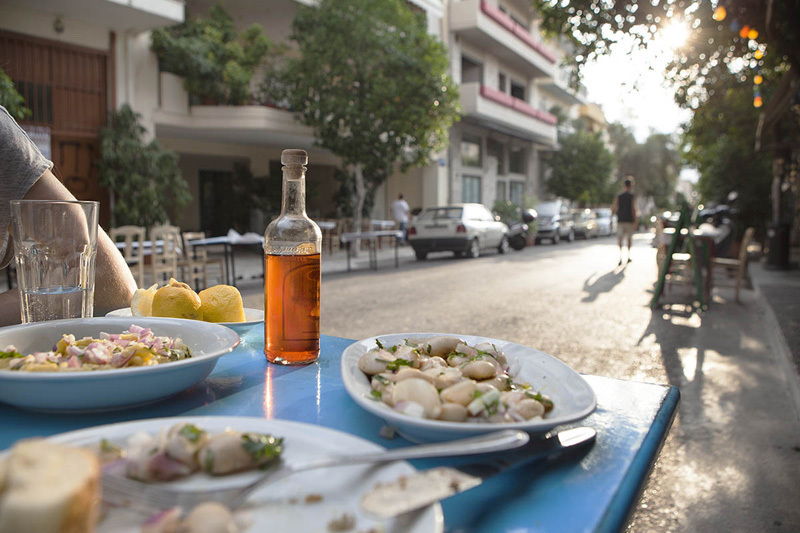 As a result, long-established businesses catering to locals like the legendary old-school taverna Oikonomou, the historic open-air cinema Zephyros, and the affordable meze joints Aster and To Tsipouradiko tou Apostoli have flourished. 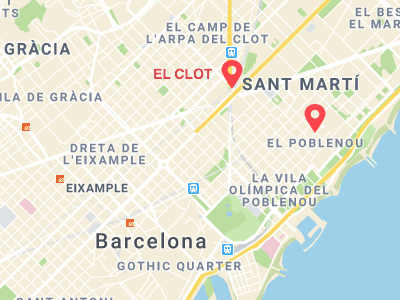 Moreover, planning restrictions on buildings above a certain height have helped to preserve Petralona’s interesting mix of architecture, which range from prewar neoclassical buildings to modernist apartment blocks. 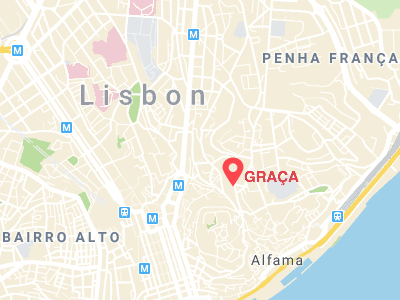 Sitting on a hilltop, the highest in Lisbon, right next to the picturesque Castelo de São Jorge, Graça could sell tickets as the neighborhood with the best panoramic views in town. Two of the city’s most beautiful miradouros (viewpoints) are here (Graça and Senhora do Monte), and there’s nothing that the other six hills of Lisbon can do about it. Sadly the tuk-tuks, those motorized, three-wheel vehicles whose colonization of the city coincided with the tourism boom, have also found them, so gone are the days when you could leisurely sip a drink in Esplanada da Graça or contemplate a peaceful sunset in Senhora do Monte. Now it’s even a struggle to find a place to take a photo. Yet if you venture deeper into the neighborhood, there are still corners that remain untouched by mass tourism. Most of the area dates back to the 18th century, but it was only after the 1755 earthquake that its population began to grow. Perhaps the biggest change to the urban landscape came in the 19th century with the Industrial Revolution: the old working-class villas (villas operárias in Portuguese), now a distinctive feature of Graça, were built to lodge the factory workers coming from different parts of Portugal. Villa Berta (from 1902) is the most beautiful but Estrela d’Ouro (1908) might be the most original. The renewed attention on Graça is not surprising: artists and poets have long been fascinated by this hilly neighborhood. Sophia de Mello Breyner Andresen, one of the most important Portuguese authors of the 20th century, used to contemplate the river and the city from the Graça miradouro, which now features a bust of the author. City hall has also invested in sprucing up the area. The main square and the garden (Jardim da Cerca da Graça) descending towards Mouraria have been renovated, while the controversial Graça-Mouraria funicular is currently under construction. Despite the crowds that are trickling in, we’re drawn to this residential neighborhood because it’s bursting with interesting new spots, like the restaurant Taberna do Mar, the craft beer bar Taproom Oitava Colina, the clubs Camones and Damas, as well as a new café in A Voz do Operário (The Worker’s Voice), an association that’s more than a century old. What’s exciting and refreshing is that these newcomers coexist with older spots, rather than pushing them out. 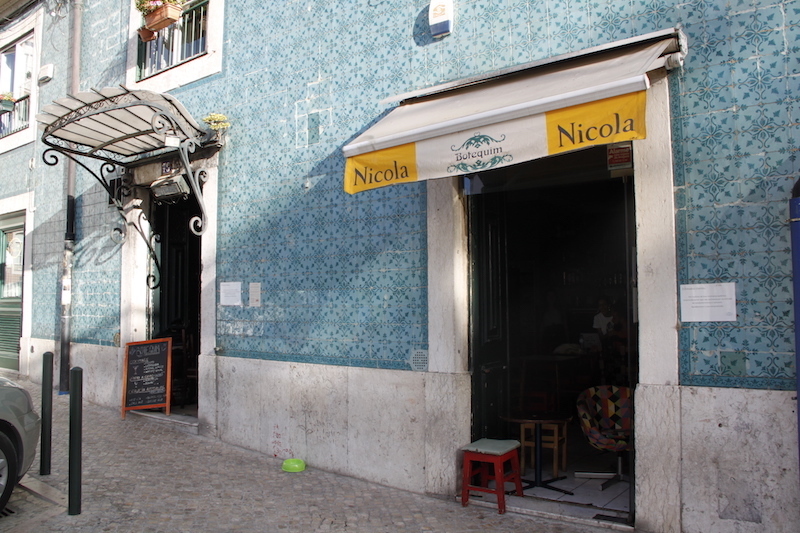 Like, for example, the tascas O Satélite and Cardoso da Estrela, the restaurants O Pitéu da Graça and Via Graça, and Botequim, a bar originally founded in 1971 by the poet Natália Correia, one of the iconic women who railed against the dictatorship and whose name was given to a street in Graça. Mexico City’s Juárez neighborhood, with its central location along Avenida Reforma, is one of the city’s oldest. Yet successive waves of residents and businesses have changed the face of the neighborhood many times over. 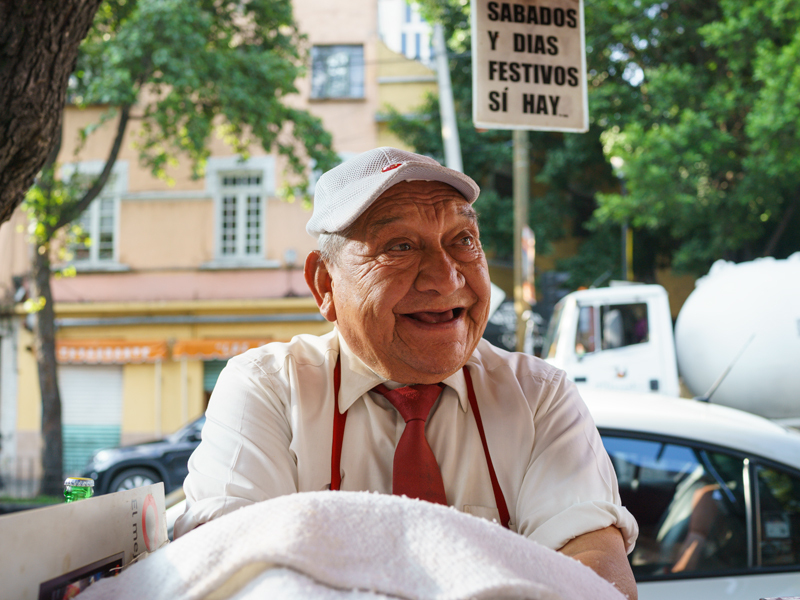 Nowadays, despite being small, Colonia Juárez encompasses the vast diversity of Mexico City. The neighborhood was originally created in the late 1800s by the Chapultepec Land Improvement Company – the American businesspeople that owned the company divided up the lands of a former hacienda. The area was subsequently named Colonia Americana when it was formally recognized in 1898 (it was renamed Colonia Juárez in 1906 to commemorate the centenary of President Benito Juárez’s birth). Some of Mexico City’s richest families settled here in palatial homes along streets named after European cities: Berlin, Barcelona, Turín. Yet Juárez was hard-hit in the 1985 earthquake, leading many residents to abandon the neighborhood. During the 1990s, Juárez, specifically Zona Rosa, earned a new reputation as a haven for the city’s growing LGBTQ community. Today Insurgentes, the longest avenue in the city, cuts the neighborhood in half, east-west, and the two sides couldn’t feel more different. You can still find vestiges of the old Juárez in historic homes on the neighborhood’s eastern edge and traditional eateries near Mercado Juárez, which is tucked in the southeastern corner. We often find ourselves at Gabi’s Café for chilaquiles and panque (pound cake), and to soak up its old school feel, which manages to endure even as new restaurants, like Café Nin, one of the neighborhood’s upscale breakfast spots, and high-end condos pop-up around it. 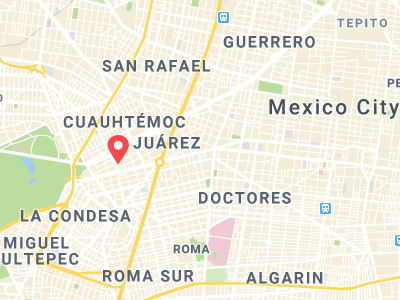 (For its proximity to the business district of Reforma and the hip enclave of Roma, Juárez is one of the city’s most rapidly gentrifying neighborhoods, making it a popular spot with entrepreneurs and restaurateurs.) We also frequent the fondas, or lunch restaurants, near the market that still offer full meals for as little as 40 pesos ($2), a rarity as cost of living in the neighborhood creeps upward. But if you head west to Zona Rosa, the neighborhood’s heart, you’ll find Japanese and Korean restaurants, sometimes in the shadow of skyscrapers. Mapo Gal Bi, with its cozy wooden booths, offers the best Korean barbeque in the area; for Japanese food, we head to Kaminari Tonkotsu for delicious ramen and Tokyo Restaurant for affordable set lunches. 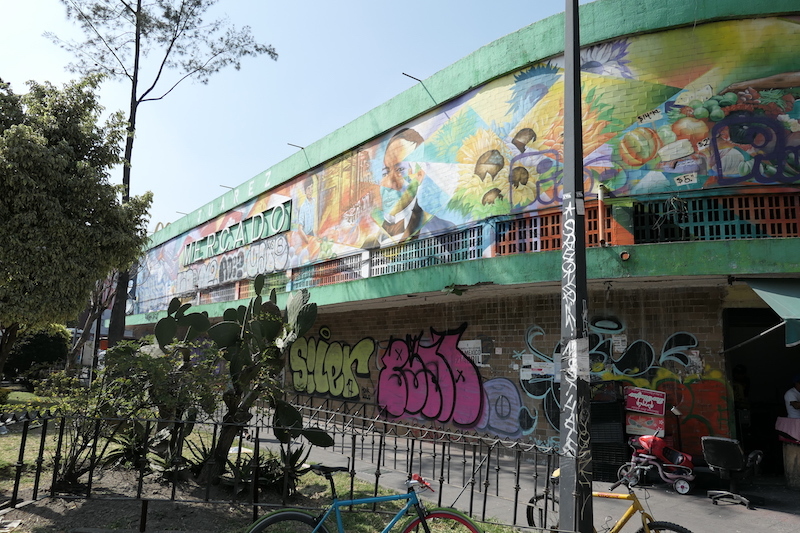 The Japanese community in Mexico City goes back generations, but since trade cooperation expanded between South Korea and Mexico in the 1990s, the Korean community has grown; both have largely settled in the area. 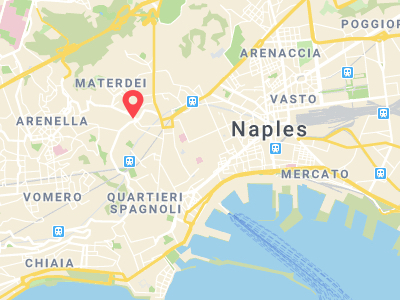 Until a few years ago, the neighborhood of Materdei, “middle ground” as Neapolitans like to call it, was known for being just that: an unremarkable district squeezed between the ancient city center and the upper part of the city, the hillside neighborhood of Vomero. That’s not to say it’s necessarily unattractive; built mainly after the Second World War, the area is home to appealing buildings and urban parks in the Liberty style (the Italian Art Nouveau), typical of Neapolitan construction in the early 20th century. Recently, however, Materdei has experienced a cultural and artistic rebirth. 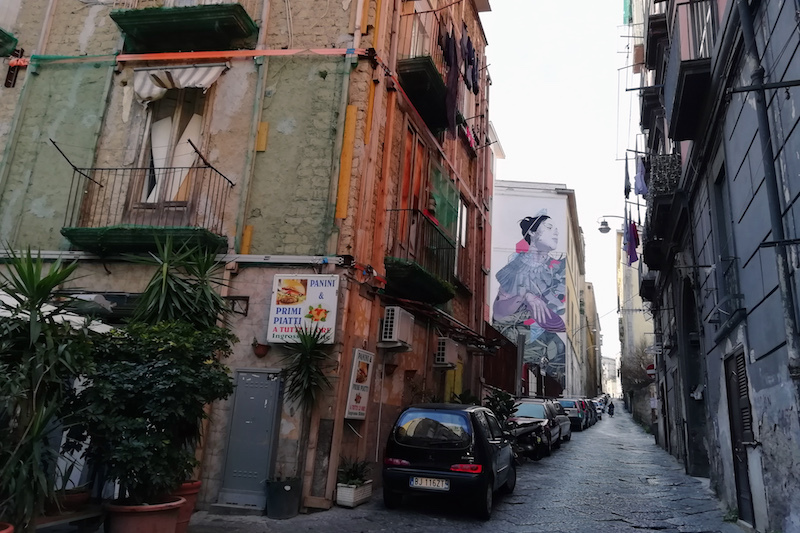 Many buildings are covered with murals and street art – the young Argentinian street artist Francisco Bosoletti’s large-scale work “Parthenope,” which was inspired by the legend of the siren who allegedly gave her name to Naples, has become a symbol of the area and is particularly beloved. 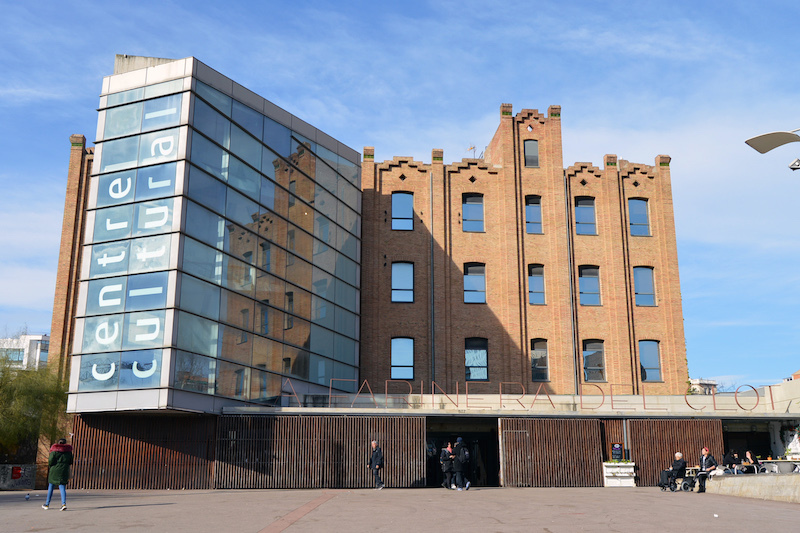 Moreover, community organizations have sprouted up, turning disused buildings into thriving cultural centers and meeting points for the local community. 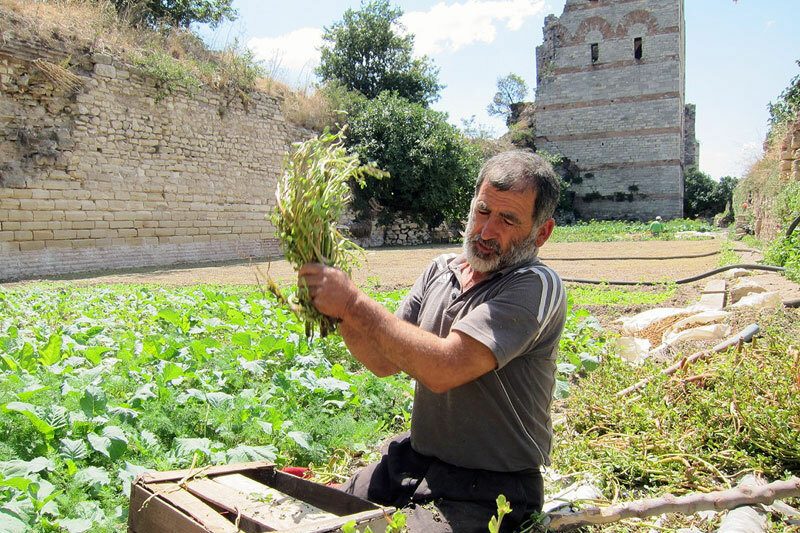 Je So’ Pazz has occupied an abandoned psychiatric hospital, which they have turned into a community center open to all, while a group of neighborhood associations founded the Liberated Garden of Materdei in an overgrown former convent. One benefit of being overlooked, though, is that a number of gastronomic gems catering to locals have flourished in Materdei. Some of them are well known, like Pizzeria Starita, one of the city’s most famous pizzerias. Serious pizza eaters arrive from every corner of the region to try their exceptional pies, like the pizza with zucchini, zucchini flowers and provola cheese, the pizza with radicchio and Gorgonzola, and the baccalà pizza (our favorite). Others are not quite as popular but no less tasty, like Cantina del Gallo, an old country winery near the famous Fontanelle Cemetery that prepares the legendary pizzicotti (small rolls stuffed in six different salty ways). Or the lovely Caseari Cautero, a tiny wine shop where a Neapolitan doctor fond of French Champagne will guide you on a tasting journey through various types of local meats and cheeses, all paired with excellent wine. One of Porto’s best-kept secrets is Fontainhas, a residential neighborhood that rarely appears on postcards or guides. When walking across the Luis I Bridge, the iconic metal arch spanning the Duoro River, towards the tourist zone of Ribeira, the eye always turns to the left, where the sun goes down and everything seems to shine more brightly. But just as not everything that glitters is gold, one can find some of Porto’s greatest riches on those less shiny streets to the right. 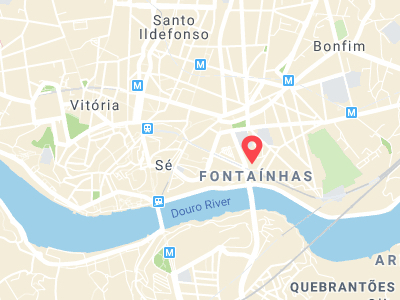 Even though they’re facing the dual pressures of unabating tourism and real estate development (its prime location on the banks of the Duoro River is both a blessing and a curse), the locals in Fontainhas are not being pushed out without a fight. They resist, even when parts of the escarpment, the precipitous slope separating the river from upper Fontainhas and onto and around which roads, rail tracks and makeshift houses and gardens have been built, collapse, threatening the security of the many structures piled atop it. We recommend getting lost in the steep streets in and around the escarpment (assuming you’re not afraid of heights), where you can experience the truest Porto there is: people who speak very loudly, neighbors who shout from window to window, house doors left wide open, the smell of wood fires and cooking food, fishing rods in action along the river bank, the trains that pop in and out of the tunnels. There are the remnants of old buildings everywhere, but the scenery and the calm – we’re far away from the stress of downtown – make up for everything. 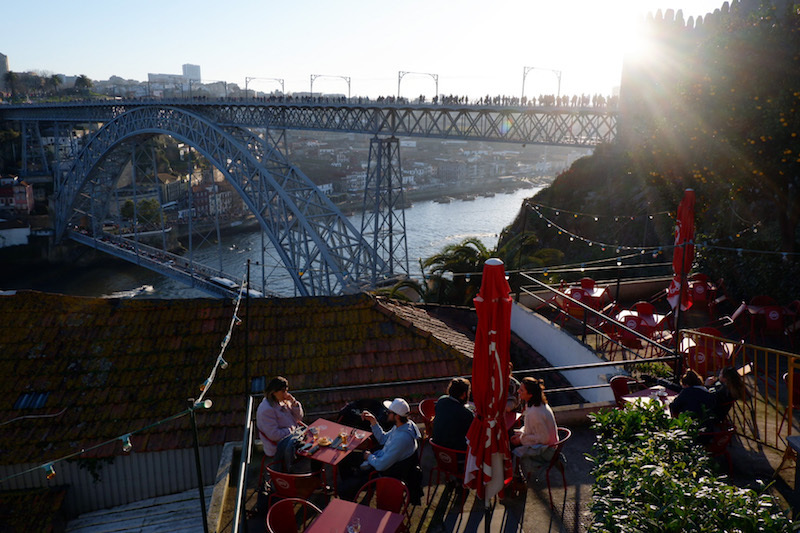 One potential route begins at Jardim de S. Lázaro, the oldest municipal garden in Porto; from here, you can walk down the street to Ponte do Infante – to the left of the bridge is what many call “the balcony over the Douro,” Alameda das Fontainhas. This long, wide avenue used to host the Vandoma Fair (antique fair) and where, every year, the city’s most popular party to celebrate São João, the city’s patron saint, takes place, with sardines being cooked on large grills and wine flowing freely. The charm of the neighborhood continues below. Just follow the sound of female voices singing and you will find, just under the bridge, the Lavadouro das Fontainhas, a public laundry. A bit further on is Shiko, a Japanese restaurant on Rua do Sol with the welcoming feel of a tasca, and Guindalense Futebol Clube, a perfect spot to watch the sunset with a fino (beer) and peanuts. Join our Porto culinary walk for a deeper dive into Fontainhas. 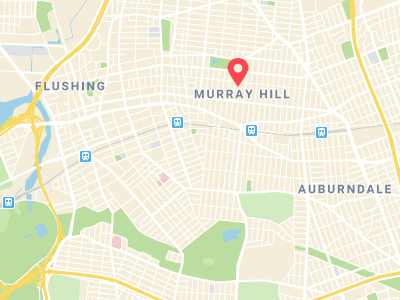 Ask New Yorkers for directions to Murray Hill, and most will point you toward the tony East Side of Manhattan. It’s there that Robert Murray, scion of a prominent family of Quaker merchants, built his home in the 1760s. But the family also owned a nursery of more than 100 acres, filled with trees and other plants imported from around the world, in what was then the Town of Flushing. In the late 1800s, when the nursery gave way to residential development, a second neighborhood was named for the Murray family. This newer Murray Hill is much less well known. The 7 train that carries hungry travelers from Midtown Manhattan and along Roosevelt Ave., in Queens, terminates in the heart of Flushing’s Chinatown. 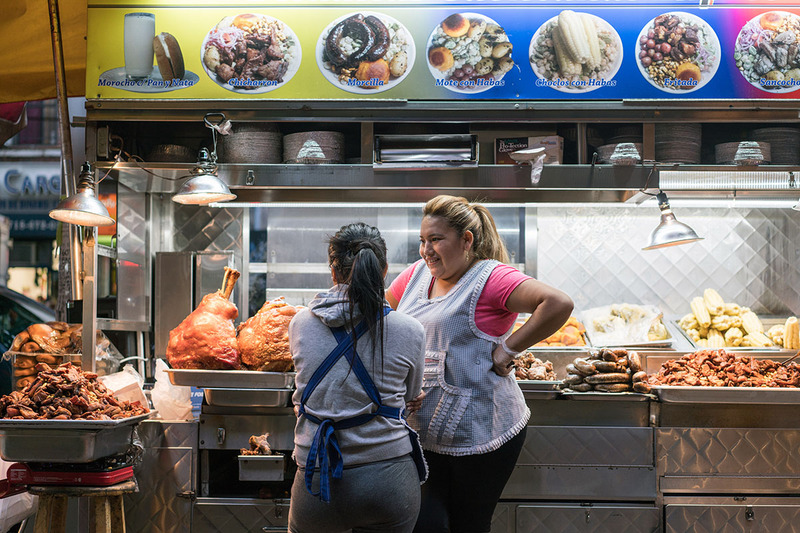 To venture beyond, and eastward into Murray Hill, requires a bus transfer, a ride on the commuter rail, or perhaps a vigorous walk, which does build the appetite for our destination: Koreatown. To be sure, not far from the original Murray Hill, Manhattan has its own Koreatown, too; it has the feel of a business district with after-work drinking hours. By contrast, its namesake in Queens is truly a neighborhood, reflecting the growth, in recent decades, of a Korean-American community that has largely supplanted older populations with Irish or Italian heritage. 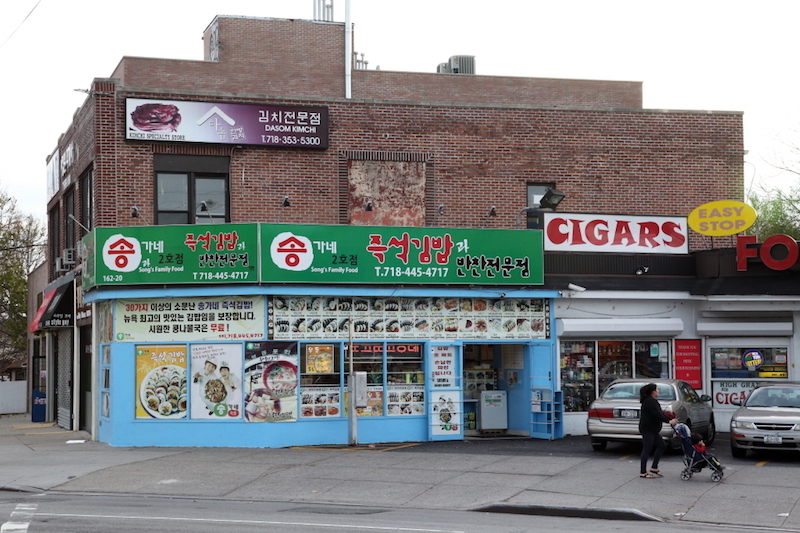 Many of the shops along Northern Boulevard, Murray Hill’s major thoroughfare, display the distinctive Hangul characters; a train station is decorated with a mosaic of traditional pottery remnants imported from the home country; appliance stores carry kimchi refrigerators. 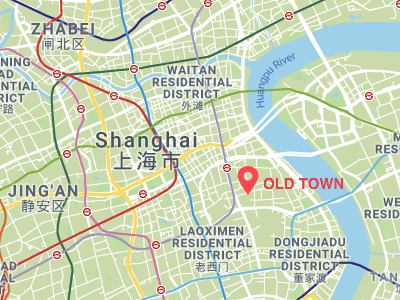 We often lament the loss of Shanghai’s historic neighborhoods (and the culinary gems hidden therein), so this year we turn to re-exploring Old Town, a 500-year-old area south of the famed Yu Gardens, east of Laoximen (the old West Gate) and abutting the south Bund area. It’s arguably the fastest changing area in the city due to increasing development encroaching from all angles, and also from within. “What little remains dates from the early 20th century, and these precious last bits are reminders of a way of life that is far from the glass-and-steel reality of today’s Shanghai: narrow lanes, hidden temples, crumbling mansions, generations-old communities and traditions, and a lively street life,” explains Tina Kanagaratnam, one of the founders of Historic Shanghai, a preservation and educational society. 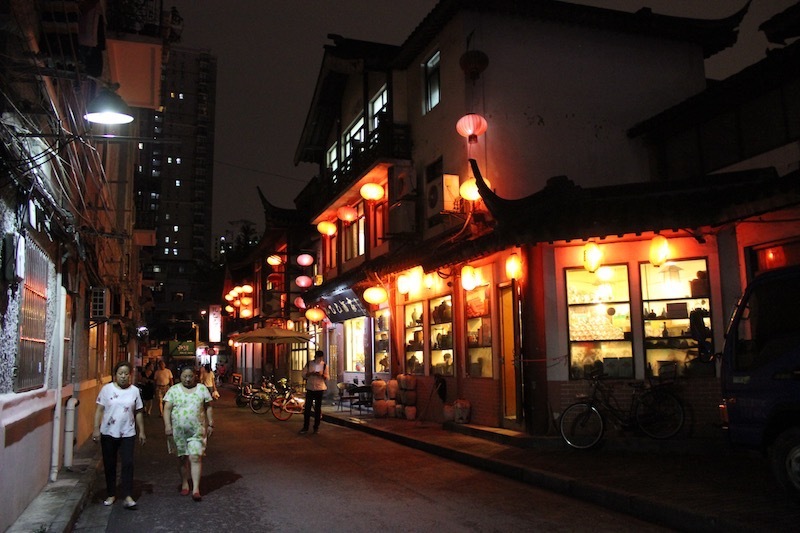 Despite the changes it has experienced, the Old Town in some ways still offers the “purest” glimpse of what life in Old Shanghai must have been like. Truth be told, the old lilong alleyway buildings that surround the Confucian temple are extremely rundown – in spite of their charms and architectural interest, years of deferred maintenance have made it much more economically feasible to start from scratch. 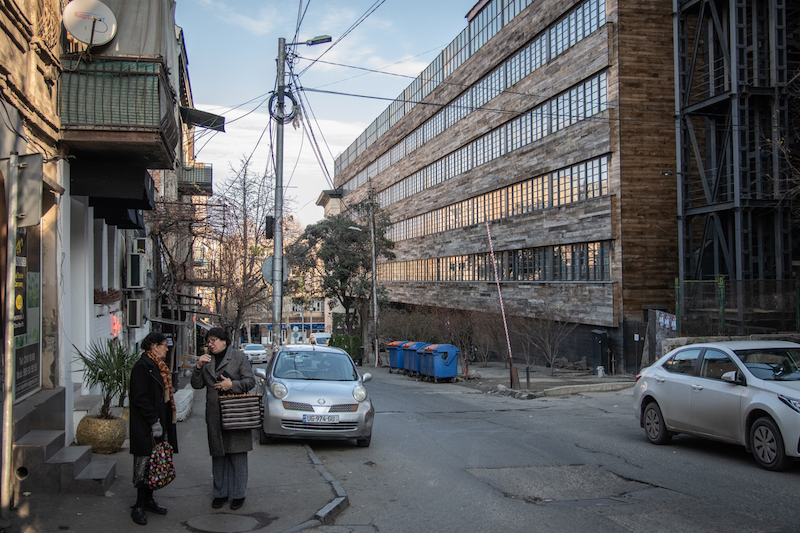 The construction marches on, despite increasing concern about preserving architectural heritage and traditional neighborhoods – that is still a luxury that some argue Shanghai can’t (or won’t choose to) afford. As a result, we’ve had to say goodbye recently to the peanut sauce dumplings at Er Guang, along with all the other late-night stops on Zhaozhou Lu and the nearby Tangjiawan Lu Market, the city’s oldest open-air food market. But a few blocks east at Ninghe Lu and Penglai Lu, a morning market still thrives. Find the intersection on a map, and get lost in the warren of alleyways that snake around the area. Nearby pioneer Jackie’s Beer Nest, with its ever-increasing selection of local beers on tap, also closed up shop in late 2018, but we rededicated ourselves to drinking even more traditionally at Kong Yi Ji with their tasting paddles of huangjiu (Shaoxing wine) aged five to 30 years in a setting worthy of the Confucius temple it adjoins. Their menu, décor and ambiance are amazing year-round, but especially worth a visit during hairy crab season in late fall. 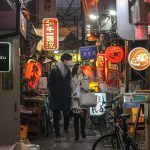 Sangenjaya – while largely off the tourist radar – has won the affection of many Tokyoites, who know that its sprawling streets and alleyways promise a hodgepodge of bars, eateries and ramshackle shops. Its name translates as “three tea houses” and it was indeed home to three of them. Back in the Edo Period (1603–1868), the area was situated where a major road divided into two popular pilgrimage routes, making it a popular place for a rest stop. Nowadays it’s bisected by a major highway and easily identifiable by the orange and aptly named “Carrot Tower” that houses a free viewing platform with good views over Tokyo and further west towards Mount Fuji. 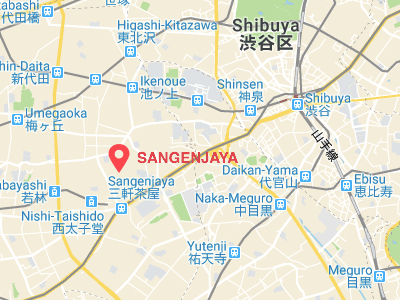 Just a four-minute train ride west of the fashionable Shibuya neighborhood, much of the appeal of Sangenjaya lies in its ability to absorb modern trends from its neighbor while retaining a charmingly scruffy feel of olden times. 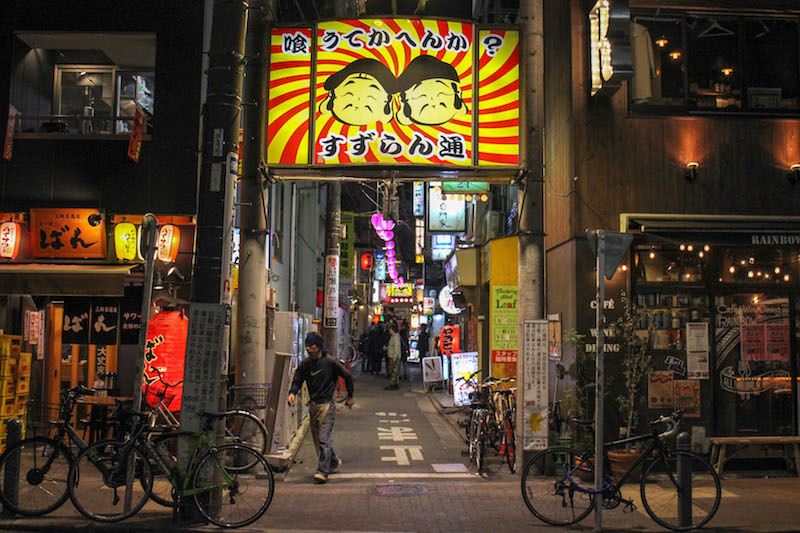 A stone’s throw from the station is Suzuran Alley with an illuminated sign inviting hungry passers-by to grab a bite to eat. 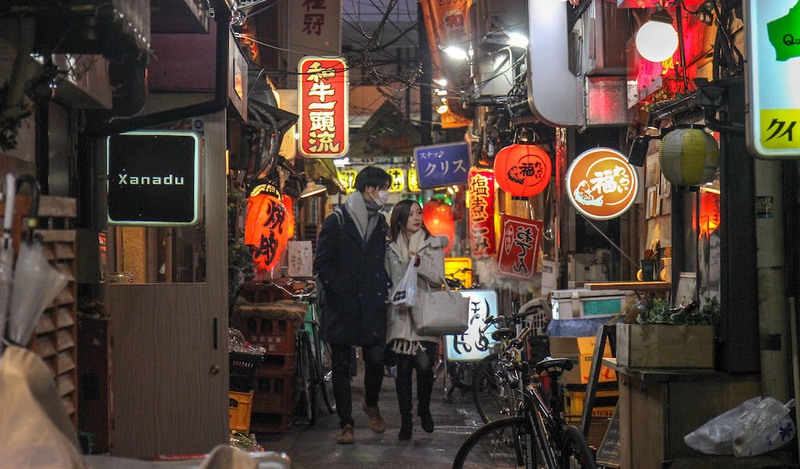 The surrounding area hides a network of alleys where smoky yakitori (grilled chicken) joints abut pokey standing bars with scrawled menus on the walls (try Sai for great sake) and sleek izakaya (a pub-style establishment) with gleaming wooden counters that target courting couples. Daytime reveals rows of shops selling everything from household essentials to secondhand knick-knacks. 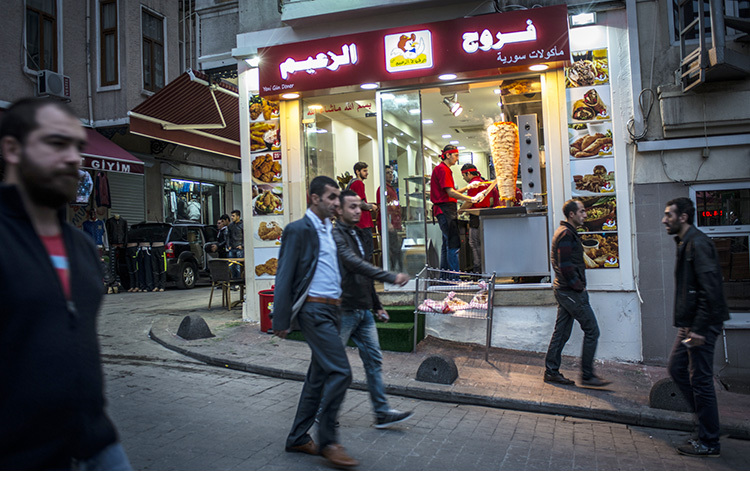 Chazawa, the major shopping street, is even closed to traffic between 1 and 5 p.m. on Sundays, allowing pedestrians to amble at leisure, perhaps picking up a coffee at Obscura Coffee Laboratory or a pastry from Boulangerie Bonheur as they go. Tiny family-run set-ups sell traditional matcha bowls only a couple of streets away from where Tokyo Saryo is riding the third-wave tea trend, offering cups of single-origin green tea in a chic minimalist room. Zen is a ramen joint that promises organic vegetables sourced from Kochi Prefecture – perhaps a nod to the more health conscious crowd, although it’s open until 6 a.m., which suggests it also hopes to pull in late-night drinkers. Regional specialties abound: at Jajaoiken, you’ll find jajamen, miso-flavored noodles from Morioka in the north, whereas the izakaya Gassan focuses on unusual cuisine from Yamagata Prefecture. But there’s also plenty of international fare to be had. There is the ever-popular Indian restaurant Shiva Curry Wara, whose founder regularly goes to India to take part in cooking classes, and the pricier, highly-rated PepeRosso, which serves up Italian fare, including homemade pasta. A short walk from both is Paopao, famous for its takeout Chinese steamed buns. Editor’s note: We will be republishing dispatches from these neighborhoods all week. Stay tuned!